Thomas Edison was trying to build a machine to talk to the dead. That statement has long been whispered amongst members of the paranormal community for as long as I can remember. In fact, I can recall first coming across those very words in an old, dusty book back in the 1970s. But today, with the evolution of Telephones to the Dead, Frank’s Boxes, and various other screeching, squawking, static-belching devices, more and more people are popping up, claiming that they are carrying on with Edison’s work. Hell, some even claim that Edison’s ghost is reaching out from beyond the grave and providing specific instructions on how to build the device he never got to complete. All this despite the fact that there is not one shred of evidence to suggest that Edison was indeed building a telephone-like device to allow the living to communicate with a ghost. That’s right; there’s no concrete evidence to support that Edison was creating a communications device for ghosts to use. There are no prototypes, no plans, and more importantly, no patents. And ask anyone who knows anything about Thomas Edison and they will tell you that above all, Edison loved his patents. And if there were even a ghost of a chance (sorry) that he was going to start working on something, he’d apply for a patent. In fact, there are numerous stories out there alleging Edison saw other inventors working on devices and then went and filed for (and received) patents on them, thereby stealing the other inventors’ work. I’m not saying that actually happened. Rather, I’m just saying that I firmly believe that if Edison was planning on working on such a groundbreaking device as something that could talk to the dead, he would have tried putting a patent on it. And yet, no such documentation exists. Don’t believe me? Take a trip up to Milan, Ohio, Edison’s birthplace, and ask anyone working at the Edison Birthplace Museum. So why do so many people still claim Thomas Edison was spending so much time trying to talk to the dead? More importantly, how did such a story get started? These are the questions that have long-since fascinated me. So much so that I keep a list of all reported places (magazine articles, newspaper reports, etc.) where Edison himself is alleged to have made statements about building his spirit communication device. Most of the publications, while often quoted, are quite rare, which opens up the door to Edison’s words being misquoted or entirely fabricated. 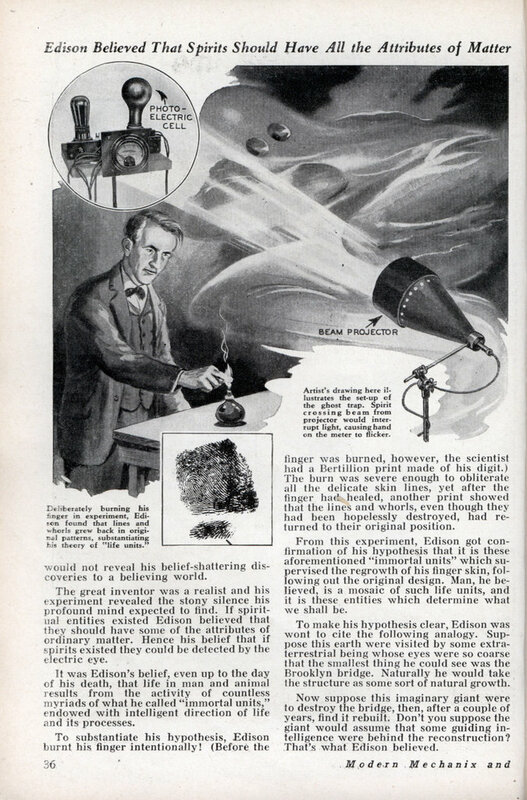 Case in point, while Edison is quoted as saying in the October, 1920 issue of The American Magazine that he is “building an apparatus” to communicate with the dead, a quote attributed to Edison that same month and year in Scientific American states that he is “thinking about” creating a device. I make it a point not to put forth anything as “fact” until I see it with my own eyes. I have yet to track down a copy of either The American Magazine or Scientific American, so I can’t comment on the validity of the statements. What I can comment on is something fascinating that I came across inside a new edition to the Strange & Spooky Museum. Seems that my loving wife, Stephanie, not only got ahold of my Strange & Spooky Want List, but also managed to track down two Edison-related magazines I was looking for: the 1970 Fate magazine and the rare 1933 Modern Mechanix and Inventions magazine. It’s the latter magazine that is often pointed to as “proof positive” that Edison was working on a communications device to use with the dead. 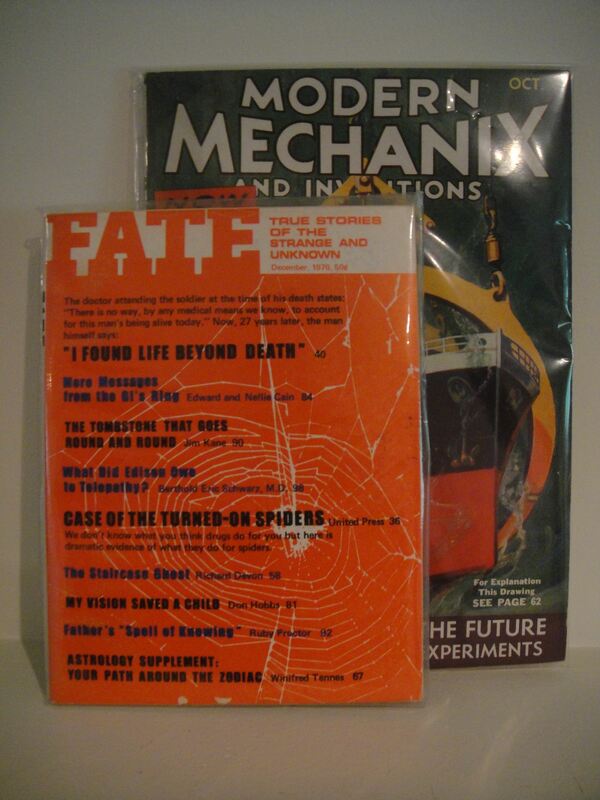 Gifts from Steph: the 1933 Modern Mechanix and Inventions and the 1970 Fate magazine. The first thing that struck me was that there is no byline for the article and no author listed in the table of contents. And aside from the fact that the article was written several years after Edison’s death, it also describes events that allegedly took place over a decade earlier, in 1920. The article, which describes Edison conducting some late-night experiments with a group of mediums, does not list any of the names of the participants, making it rather hard to research any further. Finally, the article appears in the October 1933 issue of the magazine, which might explain why the whole thing reads like a spooky ghost story drummed up merely to give readers a few chills for Halloween. But by far the most intriguing part of the article is the type of device it describes Thomas Edison using. Despite what others have claimed, the device is not any sort of telephone-like instrument designed to allow one to hear the voice of a ghost. In fact, the experiment (if it really took place) seems to be based on the idea that ghosts are made up of matter than can be detected. Instead of a communication device, what is described in the article sounds more like what today we would refer to as a sort of laser grid or motion detector. The idea being that the mediums would ask the ghost to come closer to the light, at which point it would break the beam, announcing to all in the room that there was a ghost present. For the record, the article says the experiment was a failure with no ghosts showing that night, which is why the results weren’t made public until years later. All in all, the article raises more questions than it answers. Granted, simply because the article doesn’t mention a telephone-like device doesn’t confirm Edison wasn’t building one. But you would think that if such a device existed at the time, Edison would have been using it in conjunction with the experiments described in the article. Of course, the entire article is written in such a vague, almost urban legend-like style as to make one wonder if the events described really happened at all. So I guess I’m no closer to finding out the truth about Thomas Edison and his mysterious “talk to the dead” device than I was before. But at least I’ve got a couple of totally cool new additions to the Strange & Spooky Museum! I’ll let everyone know if/when I come across some new bits of information. Until then, I’d be interested in hearing your thoughts on the whole subject. So what do you think? Was Thomas Edison really working on a device to talk to the dead with?